The Houston Midtown chapter of the Society for Financial Awareness (S.O.F.A.) has welcomed the Office of the City Controller and Bank on Houston as their newest partners. The Houston Midtown chapter of the Society for Financial Awareness (S.O.F.A.) has welcomed the Office of the City Controller and Bank on Houston as their newest partners. The city’s Bank on Houston program is designed to bring the unbanked and underbanked into the financial mainstream. S.O.F.A. 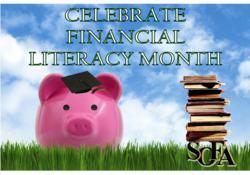 will host a financial literacy luncheon on April 5th at The United Way, located at 50 Waugh Drive, Houston, Texas 77007 . The luncheon's topic is "Financial Literacy: From the Boardroom to the Classroom." “The recession has left an unprecedented number of families financially insecure and the need for financial education has never been greater. Proper education is a key factor that will lead families to smart financial decisions,” says Alex Obregon from the Controller’s Office. “We are fortunate to have organizations like SOFA— empowering families and individuals with the use of financial education.” Obregon will represent the Controller’s Office and Bank on Houston at the April 5th luncheon. "The purpose of the luncheon is to formally announce our fund raising campaign, during which we will collect funds to be donated to select Houston schools. In conjunction with our donation, we will be providing financial education classes at the schools for faculty, students and parents," says Christopher Hensley, S.O.F.A. 's President. The luncheon is free and open to the public, but registration is required. Donations are suggested and corporate sponsors are needed. In support of Financial Literacy Month, S.O.F.A will be hosting numerous financial education workshops at companies throughout the Houston and surrounding areas. S.O.F.A has partnered with the Texas Council on Economic Education, Money Management International, FamilyMint.Com, Office of the City Controller, Bank on Houston and ComedySportz to bring financial education courses to Houston area classrooms. If you would like S.O.F.A. to host a workshop at your company or if you would like more information about this event, please visit http://www.houstonmidtownsofa.bbnow.org, or contact Christopher Hensley, S.O.F.A's President, at (832) 231-9697.